"Very cold and frosty drink served in a frozen glass. 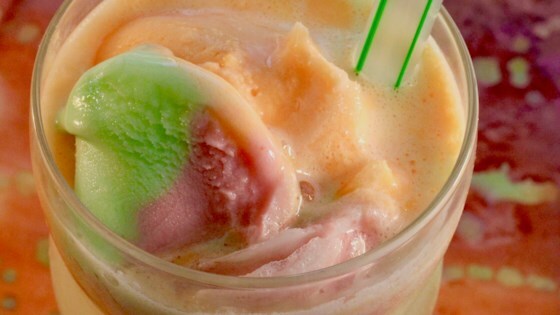 Use your favorite flavor of sherbet to mix with lemon-lime soda." Place 10 - 8 ounce glasses in the freezer overnight. Into each frosted glass, Place 2 scoops sherbet. Fill glasses with lemon-lime soda. I used raspberry and lime sherbet in the floats. Really tasty and pretty as well. I used Fresca soda. Absolutely delicious. All four of us fell in love with it.